For one of my classes this semester, we are writing a wikipedia page. Although I’ve read about how Wikipedia works, I’ve never actually done this. Very excited to learn how to contribute. Turns out, it’s pretty simple. 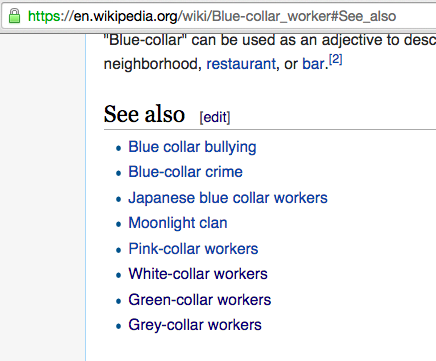 While in a class yesterday, I was looking up different labels for types of jobs, blue-, white-, and pink-collar, and found out that there is also green- and grey-collar jobs. On wikipedia, however, some link to each other but not to all. This seemed like a perfect first step! I started with the blue-collar page, went down to the “see also” section, and added some links. Toute simple. I got excited and started searching through how to add content. I found a video that I’d taken while in Florida this January from our trip to the Everglades. So I uploaded it to the Wikimedia Commons and put it on the American Alligator page. Actually, I accidentally put it on the American CROCODILE page, and as I was blogging it, realized my mistake. I learned how to find how to UNDO a change!